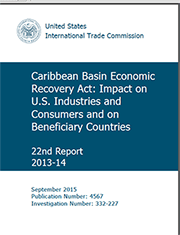 The overall effect of the Caribbean Basin Economic Recovery Act (CBERA) on the U.S. economy and U.S. consumers continues to be negligible while the effect on beneficiary countries is small but positive, reports the U.S. International Trade Commission (USITC) in its most recent report monitoring imports under the program. The USITC, an independent, nonpartisan, factfinding federal agency, recently issued its 22nd in a series of biennial reports monitoring imports under CBERA. The CBERA program, operative since January 1, 1984, affords preferential tariff treatment to most products of the designated Caribbean countries. During the period covered in the report, 17 countries received CBERA benefits including Curaçao, which was designated a CBERA beneficiary effective January 1, 2014. Total U.S imports from CBERA countries (with and without trade preferences) declined for a third consecutive year to $8.5 billion in 2014. The decline was mainly due to the sharp drop in the value of imports of crude petroleum and refined petroleum products, according to the report. The decline in imports from CBERA countries in 2013 reflected slower growth in commodity prices and a decline in U.S. demand for energy imports, among other factors. In contrast, U.S. imports of textiles and apparel from Haiti increased sharply in 2014, attributed in large part to new apparel manufacturing facilities built to take advantage of the trade preference program established by the HOPE/HELP Acts. The overall effect of CBERA-exclusive imports (imports that could receive tariff preferences only under CBERA provisions) on the U.S. economy generally and on U.S. industries and consumers continued to be negligible in 2014. The USITC identified one U.S. industry – methanol -- that might face significant negative effects due to competition from CBERA-exclusive imports. U.S imports under the CBERA program declined to $2.0 billion in 2014 from $2.4 billion in 2013. Energy products accounted for 62.0 percent of total imports under CBERA in 2014, with Trinidad and Tobago supplying 97.3 percent of energy imports. Textiles and apparel, supplied mainly by Haiti, accounted for 19.8 percent of imports under CBERA in 2014; other mining and manufacturing products, 10.7 percent; and agricultural products, 7.6 percent. Increasing U.S. production and a slight drop in U.S. consumption of crude petroleum, as well as the shutdown for turnaround maintenance of several petroleum refineries in Trinidad and Tobago, and other factors, such as changes in the U.S. ethanol program on December 31, 2011, contributed to this trend. CBERA has encouraged several beneficiary countries to develop niche exports to the United States. Most notably, The Bahamas is exporting polystyrene, Belize, fruits and fruit juices, and St. Kitts and Nevis, electronic products. The report found that investment for the near-term production and export of CBERA-eligible products is not likely to result in imports that would have a measurable economic impact on the U.S. economy generally and on U.S. producers. Although investment in Haiti's export-oriented apparel sector increased significantly in 2013-2014, Haiti will likely remain a small U.S. apparel supplier.